One last lunch in civilization at Jimmy's Hot Dogs on the edge of Bisbee, AZ. April 13: This blog has a bit of a time delay--which is why you're seeing the date this actually happened at the beginning of the blog post. In this case, my adventures on the Arizona Trail started late in the afternoon on April 13th. 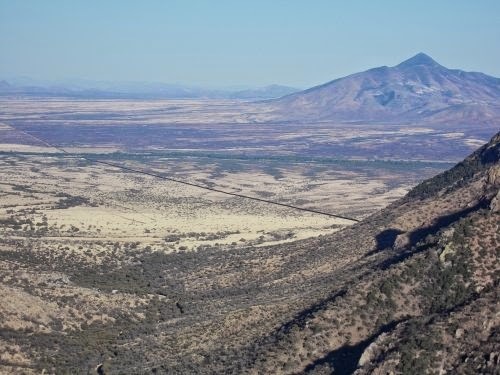 For those of you not familiar with the Arizona Trail, it's an 800-mile footpath winding through the entire north-south distance of Arizona from the Mexican border to the Utah border. It's not a particularly well-known trail, especially compared to it's more famous counterparts like the Appalachian Trail or Pacific Crest Trail, but I've wanted to do this trail for years! The desert has its own stark beauty, especially when the cactus are blooming. It doesn't hurt that this particular trail runs right through the Grand Canyon either. 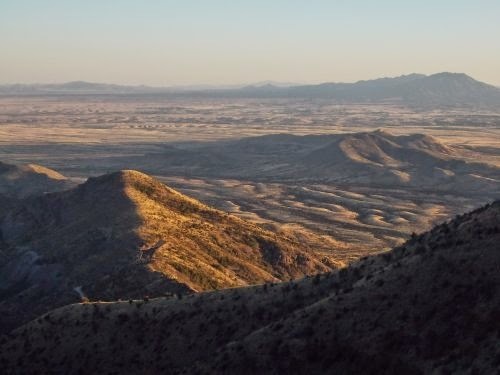 It's quite a diverse trail as well--there's a lot more to Arizona than deserts. The trail meanders through grasslands and thick forests, several areas peak at over 9,000 feet above sea level and at this time of year, snow is a very real possibility. In fact, a thru-hike in the dead of winter is all but impossible because of the heavy snow at the higher elevations. Obviously, it's not a summer hike either--the summer heat is brutal! This is a trail best hiked in the spring or fall. 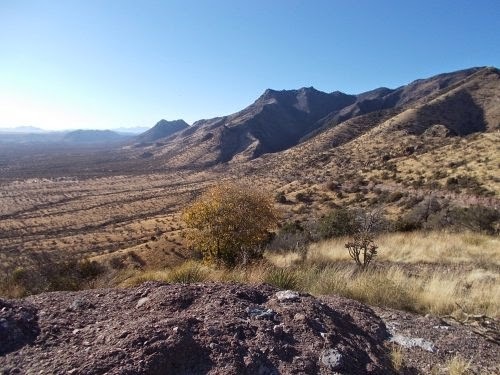 The low point for the trail drops to about 1,650 feet by the Gila River--there, snow isn't a great concern, but 100 degree temperatures certainly could be! And... the trail is essentially complete. That's a big plus for me because, as a general rule of thumb, I hate road walks, and you won't find a lot of them on this trail. At least not on the busy, heavily used roads that hikers loathe. Not to mention the chances of seeing a gila monster, I figured, were probably pretty good. I really wanted to see a gila monster. In the wild. And the Arizona Trail runs right through gila monster country. My start date was delayed a couple of weeks due to having to move all of my websites to a new datacenter. (None of you think that's an April Fools joke anymore, do you? Ha!) 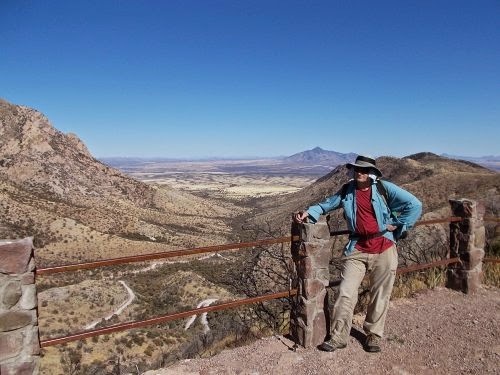 I had been hoping to start in late March when I'd likely miss more of the hot weather (although perhaps have to deal with more snow), but my late start date meant I'd likely be among the last of the thru-hikers on the Arizona Trail this season. So I flew out to Tuscon--the nearest commercial airport--where she picked me up the previous day and drove us out to Sierra Vista for the night. Which is where I woke up this morning. I had a few tasks to do before the hike actually started. Like buying groceries. I needed fuel for the trail, so Tierra drove me to Frys (that's a grocery store here, not an electronics store!). We dropped by the post office, which was closed. No surprise there--it was Sunday, after all, but I had hoped they had one of those self-service kiosks and I could mail ahead some food to the next trail town which didn't have a full-sized grocery store. They had the kiosk, but all of the priority mail boxes were locked away. Eventually, I had to leave the food behind and ask Tierra to mail it for me the next day. Mexican side when I took this photo. 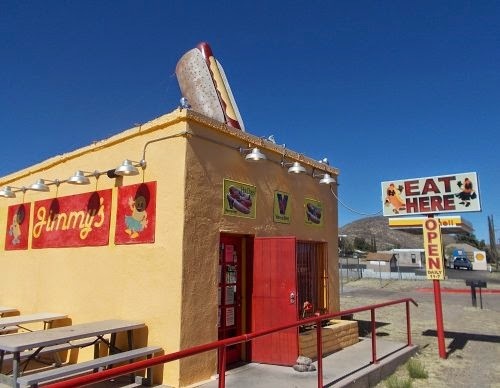 I did a few last minute fixes to Atlas Quest, then we drove out to Bisbee for a last meal in civilization at Jimmys Hot Dogs not far from the trail start. And she assured me that the food was well worth the stop. I ordered the Italiano grinder and Coke, and it was delicious. I used the toilets there--the last running water I'd be using for several days, then we packed into the car and headed towards the trail. So on the way into the Coronado Memorial, we stopped at the ranger station where I asked about the conditions on the Arizona Trail and if there was a fire on the trail. The woman manning the booth (womaning the booth?) said that she didn't know anything about a fire and that the trail was clear. At least as far as she knew. =) Whew. A false alarm. The ranger did warn me about bears which took me a little by surprise. I didn't realize that bears inhabited this part of Arizona, but I wasn't too concerned by the revelation. I had a hunch that I wouldn't be seeing any bears. She also suggested that I stay away from the Joe's Canyon Trail due to an "incident" with illegal aliens earlier in the afternoon. 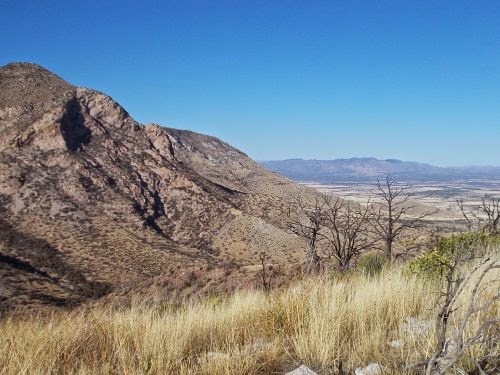 The Arizona Trail starts right at the Mexican border, but there aren't any roads or trailheads there. The closest trailhead is 1.8 miles to the north, and Joe's Canyon Trail is another trailhead option that was even further away. It was already late in the afternoon, around 4:00, and I didn't have time to start from the trailhead further away. 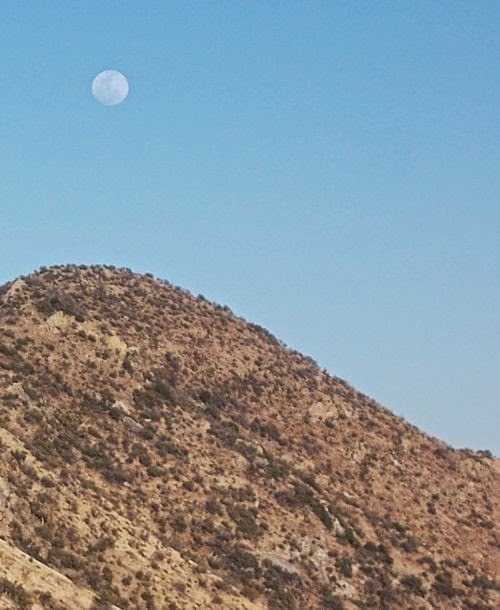 Nope, I planned to start at Montezuma Pass, hike the 1.8 miles to the border, turn around, and hike 1.8 miles back to where I started then onward to Utah. Tierra dropped me off at Montezuma Pass, and I picked up my much-too-heavy pack and started hiking southbound. It only took me about a half hour to reach the border which was marked with a simple barbed-wire fence and a monument. The monument was on the wrong side of the barbed-wire fence, but there was a large hole in the fence so I set my pack down and simply ducked through it. Into Mexico. I wondered what would happen if border patrol agents found me. I was pretty sure that barbed-wire fence wasn't meant to be crossed, but I wanted photos of the monument. And I wanted to at least touch official Mexican ground. 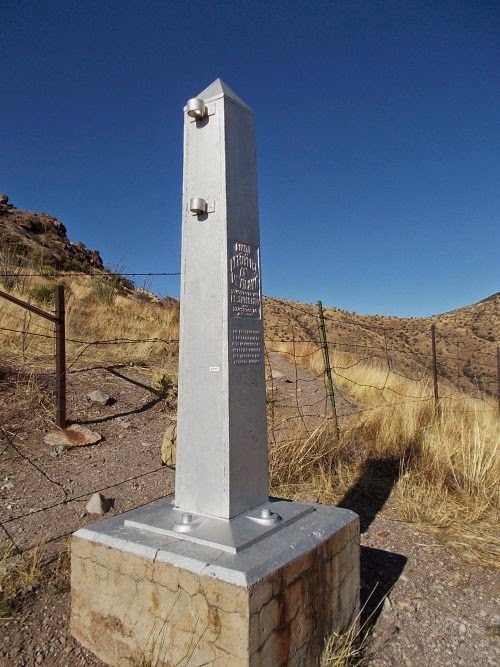 I suspect the monument is on the border, but the fence was fully on the American side of the border. I walked completely around the monument taking photos, noticing that the Mexican side was in Spanish while the American side was in English. Appropriate enough, I suppose. 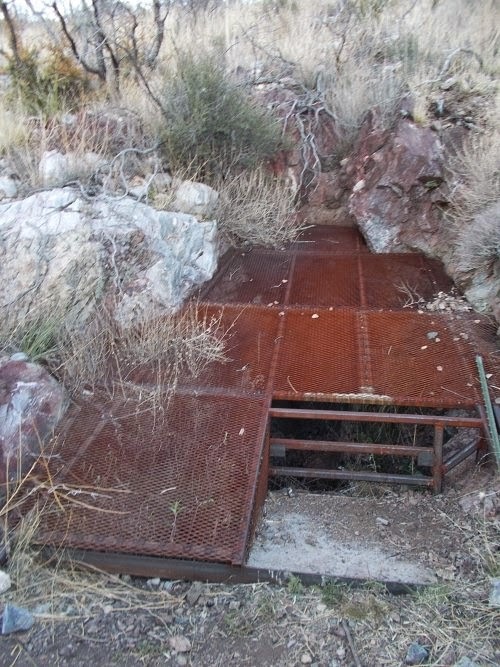 It also looked like a small game trail lead deeper into Mexico. I had no intention of following that, but I wondered if it was a game trail or a trail created by illegal aliens. For now, at least, I was by myself at the border. No sign of anybody anywhere. I took more photos than necessary, re-entered America, put on my pack, and started hiking to Utah a mere 800 miles away. I returned to Montezuma Pass then climbed a steep mountain upwards. 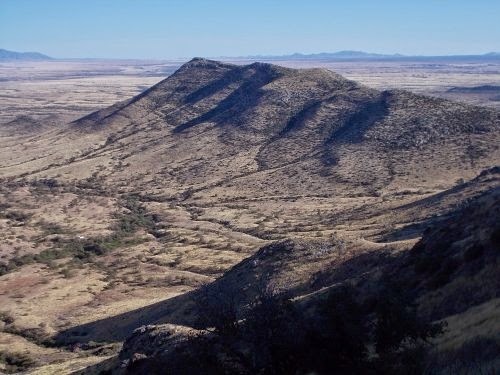 I needed to get at least several miles north because camping wasn't allowed in the Coronado Memorial, but as soon as I crested over a ridgetop the wind practically blew me off the top. Incredibly windy! If Arizona is known for anything besides deserts, it's mining, and in those next few miles, I passed three different abandoned mine shafts. 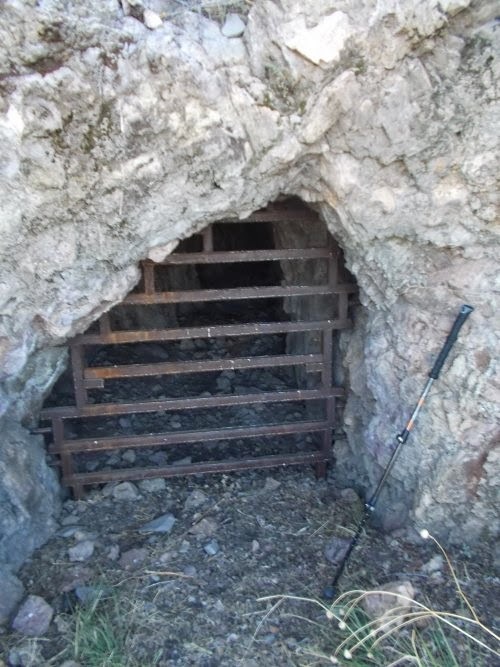 The entrances were blocked off to prevent people from entering them anymore, but I still found them interesting and wondered what might be found in them. I reached what looked like an informal campsite, but ultimately decided it was too windy and continued onward. The next campsite that I could see on my maps was at Bathtub Spring, but I knew I'd never reach that point before dark. It was just too far away and I started the hike too late in the day. I'd just have to camp anywhere I could find that provided at least some protection from the wind. 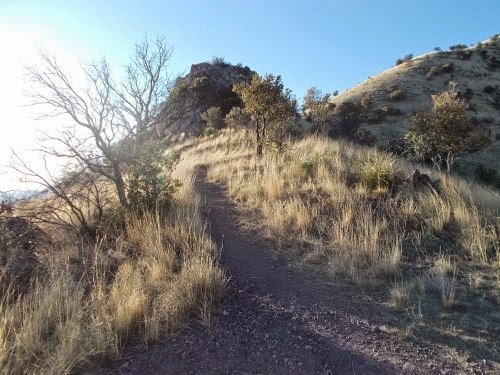 The trail continued its steady climb upwards which seemed to do nothing but make the wind even stronger, but then the trail ducked a short ways to the right and just below the ridgetop which stopped the wind dead. This little pocket of trail was deathly calm. The only problem... there was nowhere on the side of the trail to set up camp. I pushed onwards but only made it about 300 feet before the wind found a way around the ridgetop and blew me over. I quickly backtracked and found a flat-ish spot in the trail and decided just to camp directly on the trail. It was late in the evening and I doubted any other hikers would be passing by. 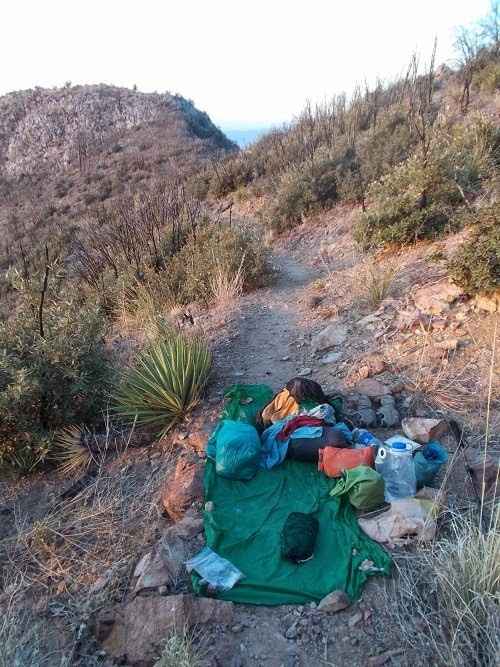 The authorities warn hikers to camp away from the trail (illegal aliens often use the trails at night), but I hoped any illegals that stumbled into my campsite would just leave me alone. I camped near 8,000 feet above sea level and as soon as the sun set, the temperature dropped dramatically. I bundled up into my fleece for the night. I had only completed about 5 miles for the day--not including the 1.8 miles hiking to the border before turning around and hiking north. It wasn't as much as I had hoped for, but it was official. My hike had begun! 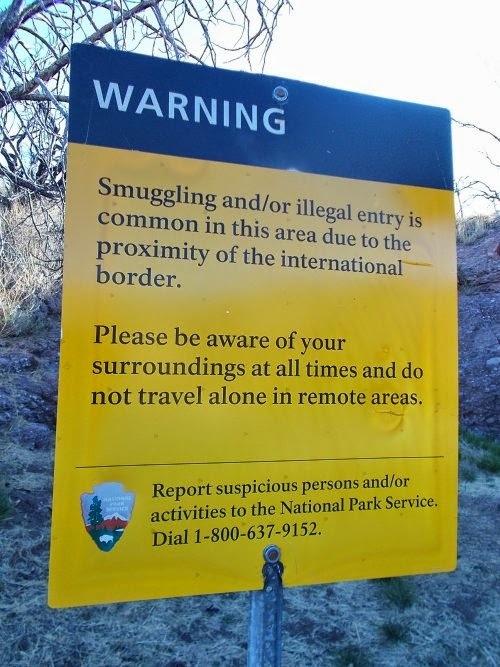 This sign at Montezuma Pass warns to "not travel alone in remote areas." the low desert. So everything behind that line is Mexico. it goes up and up, eventually peaking at over 9,000 feet above sea level. get a sense of its size. It wasn't very large--I'd have to duck to get in. 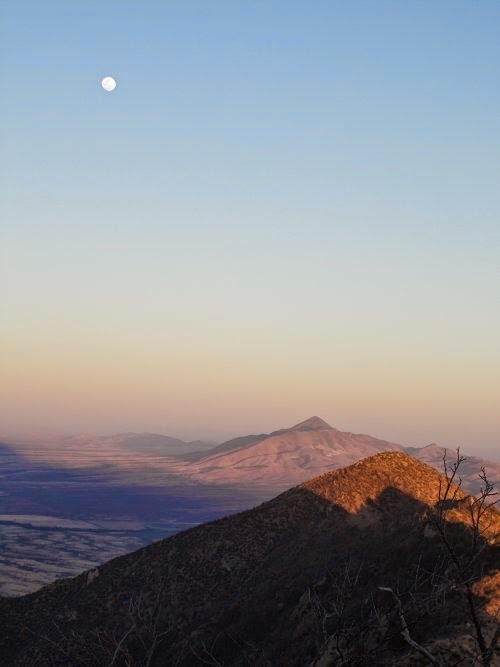 Dusk over the Coronado National Memorial. Camping on the Arizona Trail where it's protected from the wind. Just hope no illegal aliens trip over me during the night! Oh man, I can't believe we have to wait two whole days to find out if you were kidnapped by illegal aliens in the middle of the night. The suspense!! Good photos! I started reading the blog late. But I'm just starting the virtual hike today so this is perfect for me. Good blog too very informative. Day 3: My Kingdom For a Drop of Water! Day 2: Fire on the Trail!